Packaging: Slim plastic packaging with gold cap. I always love Estee Lauder packaging, because it is simple but also look very elegant and expensive. It contains 30ml of products. The main color of the packaging is beige. I love how they make this BB cream handy and can fit my make up pouch perfectly. I always have difficulty when bring BB cream in my pouch because mostly it has big / fat packaging type. Swatch: To be honest, I kinda freaked out when the first time I saw the color on my hand. It looks so brown for me. My skin tone is very light and I think this color will not suitable for me. But when I try to blend it, it surprisingly quite good on my skin. Yes, it still looks a little too dark for my skin tone, but I can always correct it with lighter powder as a finishing. Coverage: This BB cream only provides medium coverage. 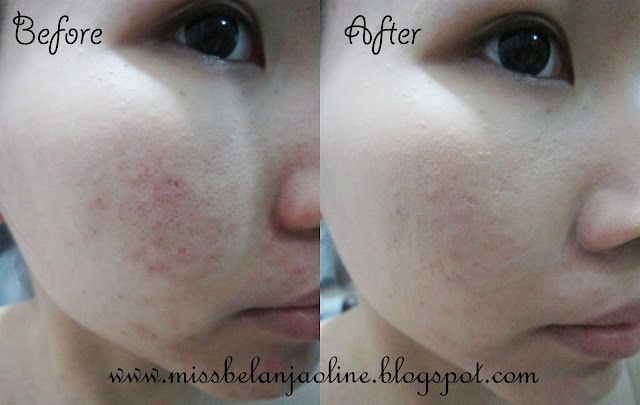 It covers redness well but for deep acne scars, you maybe need more concealer for more coverage. I prefer to use this BB as my daily make up because it is very lightweight and it doesn't makes my skin condition worse with new acnes. It is also very moisturize. People with dry skin sure more suitable with this BB, but for oily skin like me, it will makes my skin glowing or you can say oily after couple of hours. After all this BB's claim to be "all-day glow"
To complete the formula, this BB also contains sun protection, as it labelled SPF 30/PA+++. I rarely use sunblock because too much of it will makes my skin break out. So, I always prefer 2 in 1 base make up that contains SPF. Mostly base make up only contains SPF 15 - SPF 20 but this BB contains quite high SPF, so it really an advantage for me. Overall, I really like to use this BB as my daily make up. I don't really use make up when I'm at office. Usually I will prefer to use BB cream and loose powder and then I'm ready to go. The only down point from this BB cream is, the price is expensive hehehe.. after all it comes from very well-known brand, that's why it is expensive.